Our Spectacular France trip is designed to explore the stunning French Villages, watch the tour in the right time zone and notch up some really beautiful rides. Join us and fuel your growing interest in cycling. All of our trips allow you to choose a suitable ride each day. We offer alternative ride options on most days and we try to give you as much information as possible to choose your ride. 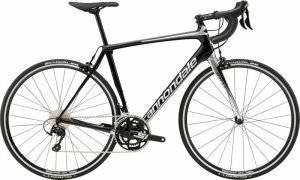 We rate each ride on various factors; distance, total climbing, intensity and altitude. Unfortunately, we can’t forecast the weather when designing our rides, but your trip leader will advise you on any precautions. In your itinerary you will see a rating for each ride option - similar to the table and diagram below. This will help you choose which ride will be best for you. Don't worry, you can make a decision the day of the ride depending on how you feel. We rate rides based on the following criteria. Our Spectacular France trip is designed to explore the stunning French Villages, watch the tour in the right time zone and notch up some really beautiful rides. 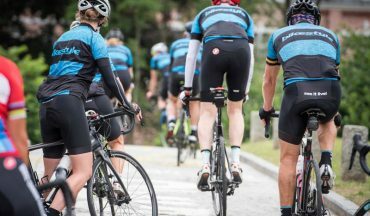 Join us and fuel your growing interest in cycling. 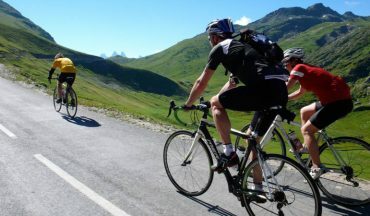 Riding in France in July during the Tour de France is a holiday of a lifetime. 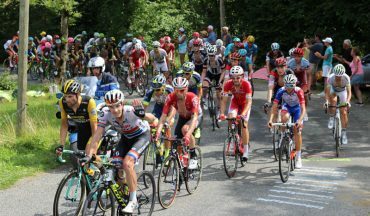 Tour de France captivates cycling fans around the world and more than any other Grand Tour it attracts enthusiasts who find equal interest in a French chateaux, UNESCO heritage sites and spectacular villages that the Tour passes. Watching the race on television in the wrong timezone is frustrating and leaves you dreaming of being there live. Designed predominantly for cyclists, we cater for non-cycling partners as well. You’ll travel like a professional cyclist in our custom fitted luxury vehicles. Starting from Lyon, a gastronomic paradise, arrive a day or two earlier before your trip starts to take in this beautiful city and adjust your clocks. Our first stopover is a stunning chateau and easily accessing the French Alps for you to conquer the mystical 21 switchbacks of Alpe d’Huez. 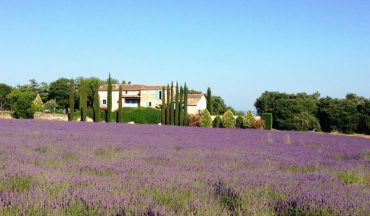 Our tour continues to Provence where we’ll explore stunning villages, fields of lavender and of course cheering the 2019 Tour de France race live. We’ll follow the Tour to the Ecrins National park to experience our first mountain stage and a stage start. Our final stopover is in a thermal spa town before heading to the city of lights, Paris on a TGV. 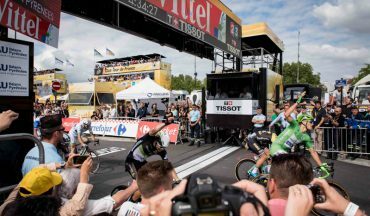 Be there in 2019 to watch the Yellow Jersey and his team lead the peloton onto Champs-Élysées for the traditional high paced circuit finish. Enquire at the time of booking about VIP experiences. Your French experience starts with a short warm up ride. We will quickly access the country roads and shake off some travel legs and test out your bike ready for your cycling holiday in France. 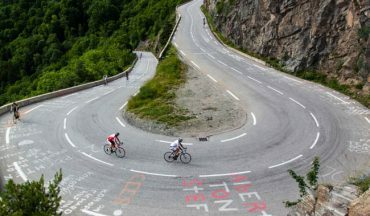 After fuelling up at breakfast, we will head off to the base of possibly the most famous cycling climb in the world – Alpe d’Huez. This morning we travel south to Provence and to our hotel in the small town of Nyons in an area known as Drôme-Provencale, also known for it's landscape of vineyards, lavender fields, olive groves and picture book villages. 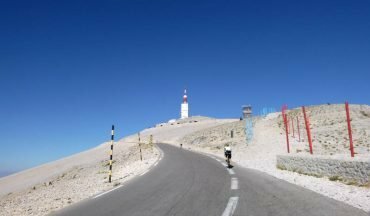 Today is truly a memorable experience, riding the Geant of Provence, Mont Ventoux. Your ride up the 21.5 km climb averaging 7.45% will be rewarded with serious oversupply of lollies and amazing views across the Luberon Valley. We will catch the race twice today, enjoy a ride to one of the UNESCO World Heritage listed sites and be looked after by our hospitality crew. We will leave Nyons this morning and travel to Gap to catch today's stage finish before spending the next 2 nights in beautiful Annecy. Enjoy a scenic climb to a nearby ski station. You’ll be rewarded with wonderful views across the Valgaudemar valley, across to the Ecrins national park. A visit to the French Alps is not complete without seeing Lac Annecy and the village. 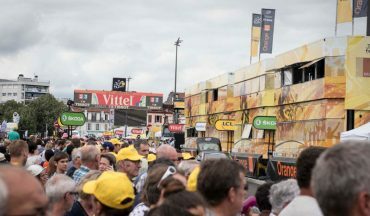 Equally, a visit to the Tour de France is not complete without seeing a stage start. Today, we’ll achieve both. Today we will enjoy a lovely ride this morning from our hotel on some very quiet and scenic roads and complete our transfer on the bus. We will pass through some lovely french hamlets with their stone houses and peaceful surroundings. Sadly your trip comes to an end today. This morning our trip finishes back where our trip started, in Lyon with our final transfer to Saint-Exupéry Airport Lyon.